Summary: DO YOU HAVE 20 MINUTES TO MAKE A GREAT MEAL? If you are anything like me, then weeknight dinners are a challenge. Yes, my family is picky. And yes, I have to worry about my son's food allergies. However, the real issue is having the time to cook. I know many of you are working women and/or busy moms (like me) and finding an hour or more to prepare a real, healthy meal is next to impossible. So get ready for this... I have some exciting news for you. I've recently discovered a terrific cookbook that just might be the answer to your evening meal woes. 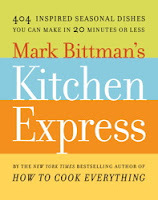 It's called MARK BITTMAN'S KITCHEN EXPRESS: 404 INSPIRED SEASONAL DISHES YOU CAN MAKE IN 20 MINUTES OR LESS. Did you catch that? Twenty minutes or less!!! KITCHEN EXPRESS is a definite winner in my opinion. Of course, the immediate appeal is that it has over 400 recipes that can be made in 20 minutes or less. But I like so many things about this cookbook. First of all, Mr. Bittman explains how to use this cookbook in the introduction. 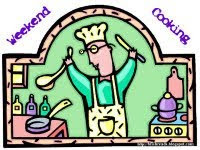 He presents the recipes in the simplest form possible and home cooks can tinker with each recipe to make it their own. All of the recipes are "precisely imprecise" which means that they do not call for specific amounts of ingredients. I have to admit that this took me a little while to get used to. I'm one of those cooks that likes to follow step-by-step directions because I have no confidence in my cooking abilities. In addition, I like the layout of KITCHEN EXPRESS. I love that the recipes are divided into chapters based on seasons. The reason for this is that Mr. Bittman wants to feature the "right ingredients at the right time." As someone who likes to use a lot of fresh ingredients, this idea really makes a lot of sense to me. I've found that it's less overwhelming to pick a recipe to make when I can at least limit it to a season. I also appreciate the advice Mr. Bittman offers in the chapters at the beginning of the cookbook from pantry suggestions, to year-round recipe ideas, to an easy substitution list. And finally, I think the recipes in KITCHEN EXPRESS are outstanding... and offer so many possibilities. The directions for the recipes themselves are extremely easy to follow -- often times, they are only a few sentences. And you can play with them! The recipes do not appear in a traditional cookbook format with ingredients and amounts listed first. Rather they are written as if someone is telling you how to cook a quick and easy meal. Each recipe is only a very short paragraph and a few recipes appear on each page. The recipes cover a very wide range of foods from salads to soups to main courses to desserts. I appreciated that some of them were rather unique (at least to my family's tastes.) All of the recipes contain fresh ingredients and they are from many different ethnicities. I can barely even begin to list the recipes that appealed to me because there are just too many. However, right now, I am drawn to the soup recipes because they are super-simple and perfect for the upcoming fall and winter months. I'd be remiss if I didn't mention that there is one thing about KITCHEN EXPRESS that didn't exactly thrill me. It's that this paperback cookbook does not contain any pictures. I love to just look at the pictures in cookbooks for fun, and I was sad to see that this book is just filled with text. Having said that, this cookbook is a terrific bargain at $15 and it has tons of very do-able recipes. 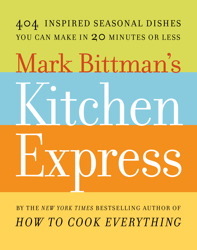 Mark Bittman is the New York Times Bestselling Author of HOW TO COOK EVERYTHING and he also writes a weekly New York Times column called The Minimalist. In addition, he appears regularly on The Today Show and has hosted his own public television series. So I guess what I'm saying is that this guy knows food and cooking. I have my own copy of HOW TO COOK EVERYTHING and I've found that it's an incredibly useful reference book! Highly recommended for busy women looking for quick meal ideas! I really like Mark Bittman and own a few of cookbooks. I'll have to pick this one up. I am always telling people that that you can cook from scratch in 20-40 minutes. I do it most nights. You had me at 20 minutes, I tell you. With the kids sports and other things going on, dinner time is insane and I'm always stressing myself out trying to figure out how to make a proper meal when I'm never there! I'm going to check this one out. A meal in twenty minutes? I have to check this book out. Although it drives me crazy when there aren't any pictures in a cookbook. Maybe there aren't any so we won't be disappointed if our creation doesn't turn out looking like the one in the picture? I love pictures in cookbooks too, but I think they're left out at times to keep costs down. I'm kind of over cooking, so 20 minutes sounds good to me too. I may have to check this one out! Did it really take 20 minutes?? I love the idea of 20 minutes. Not so keen on no pictures or imprecise recipes! I"m am all for any cook who can help me get a healthy and fresh dinner on the table. I enjoyed your review. There are quite a few recipes for vegetarians, but I suggest taking a peek before purchasing just in case. Thanks! Taking a peek would be quite difficult though because I live in the Netherlands, I have to import the book ;) But I will have a look around. That just kills me when cookbooks don't include pictures! But the 20 minute part is tempting anyway! Sounds like a perfect one for me. Honestly, a lack of pictures doesn't necessarily bother, especially since my dishes never look quite as good as the photos anyway.